I think it makes sense to say what service is being used, either when the user is submitting a website-is-inaccessible report or when Firefox is reporting that a page my be inaccessible based on location, e.g. 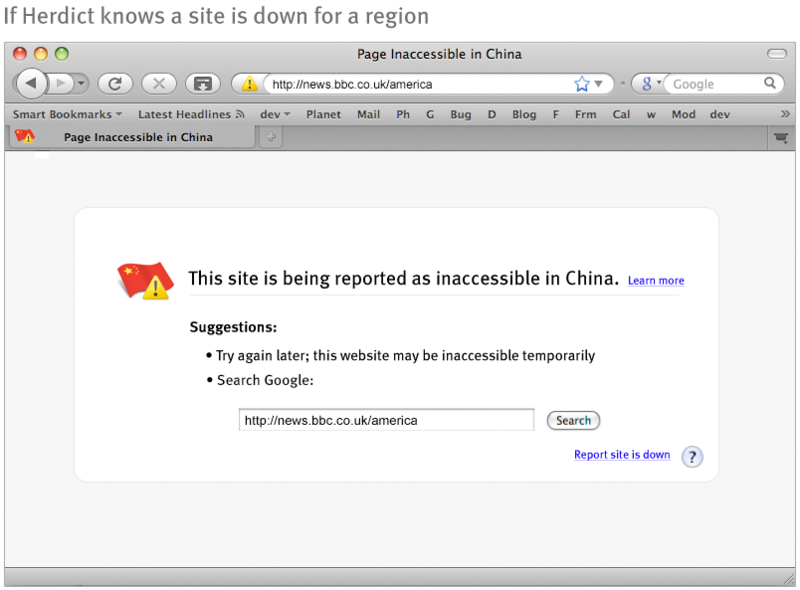 “this page has been reported inaccessible in China”. 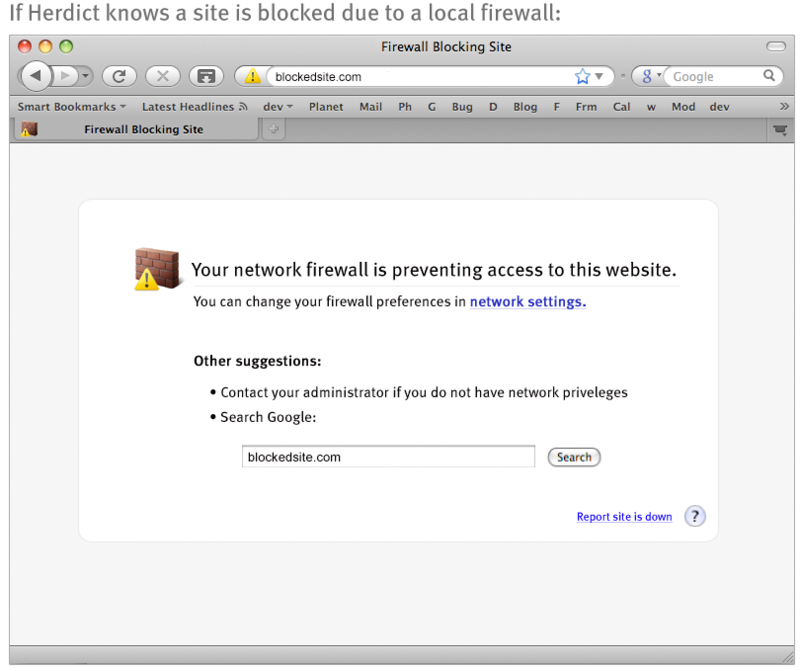 If Mozilla is running the service, it wouldn’t be necessary, but if it’s a third party service, e.g. Herdict or Google LinkDoctor or whatever, I think the users should be informed. This could be done on the “more info” pages so it’s available to the curious but doesn’t clutter the primary screens. But it ought to be pretty easy to find out what’s going on. It would be nice to be able to diagnose a network problem as being local (due to a firewall, for example), but in my experience there’s often no way to tell. All Firefox knows is that it tried to make a connection and couldn’t. Superb ideas. 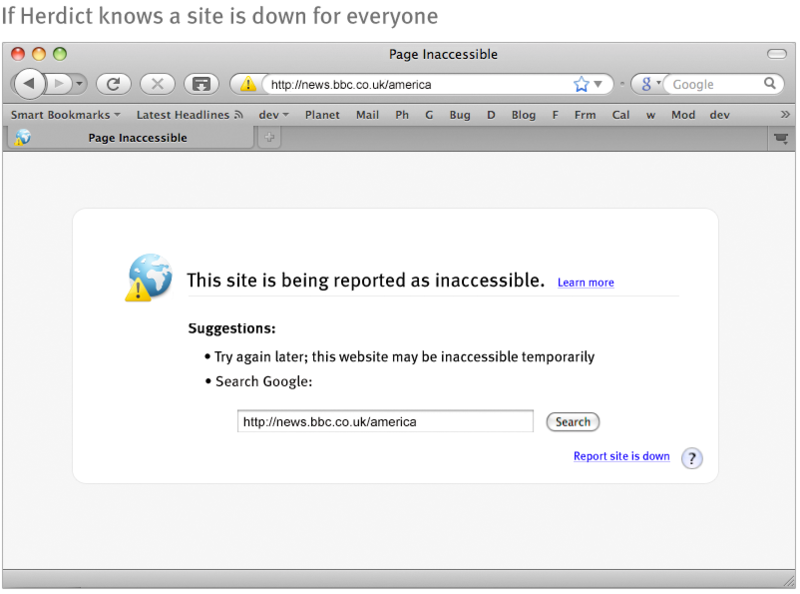 Then follow on to add options to automatically report when sites are down. (with a sub-option to stop in private browsing mode). This may lead to some false positives if you temporarily have local configuration problems (especially for people’s home page), but that will disappear in the aggregate. 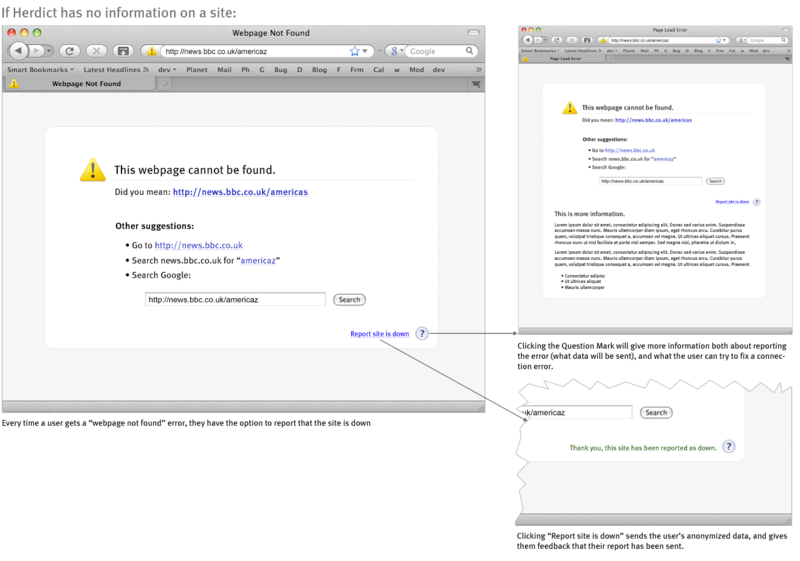 Also suggest adding links to Google (/Yahoo!/Bing/etc) cached copy, and also Archive.org. There is just one problem with the first mock up. The question mark icon looks as though it does the same thing as the blue link. Awesome mockups, yo. I’ve added a link to this blog post on https://wiki.mozilla.org/Firefox/Projects/Herdict. Another thing that could be included on error pages is the complete url, as typed, in a large font. That would make spotting typos easier. It has always bugged me that firefox makes very little (visual at least) distinction between “dns server timed out” “dns server nxdomain” “tcp time out” and “http 404”. “proxyserver is not connecting”Sometimes the wording varies abit and starts with Firefos is configured to a proxy server tha is refusing connection.